WIN BIG! YOU DECIDE HOW BIG! Okay, who doesn't like Tupperware? This time of year, every year, I fall in love with it over and over again. All the new things, in the new colors ... that are perfect for entertaining all the friends we'll have over this summer. Or holding all the quick meals I'll prepare before we run off to ball games. Or that I'll just slip into my bedroom and night and cuddle with. Yeah, I really love Tupperware. I hate to rope people into coming to a party and feeling obligated to purchase something. It's a feeling I hate and I refuse to do it. So, when a friend asked me to host a party, I half heartedly agreed ... to a book party. Then I found out about this new "online party" thing. I knew it was something I could definitely do. It was right up my alley and I was actually excited. Since I consider you all my friends ... you are all invited. If you order any Tupperware from my party using THIS LINK, you will be entered into the contest. You'll have until Wednesday, the 14th. On that day, I will choose a winner using a random number generator and that person will receive a check for their entire purchase price, making their order FREE, IN ADDITION to a $50.00 gift certificate for more Tupperware. Email me to book your own party, and I'll enter your name in for the drawing TWICE. If you place an order, let me know what struck your fancy. I have a little somethin' somethin' for each and every order placed ... so everyone is actually a winner! You only have until Wednesday, so let's GO SHOPPING! You'll also find some great specials below! It's not listed above, but I'm getting the "Insulated Tumbler w/ Dripless Straw Seal", as it will be perfect for the baseball & football games we attend. Perfect for my pop or tea that I bring along to the games. You might like it too! Just type in Insulated Tumbler when you get to the Tupperware Site. What is your favorite piece of Tupperware ... and why? If you're here via the Ultimate Blog party ... Welcome To An Iowa Mom. I'm super glad you stopped by. I know that you have a ton of Blog Parties to head to, so I'll just tell you a little bit about me, my family and my blog and then let you subscribe for updates over there ------> and then you can come back and visit me again, when you have more time to stay awhile. Deal? Hmmmm. I live in Iowa. And I'm a Mom. DUH - I wasn't just making up the title An Iowa Mom to look good. HA! We all know how EVERYONE wants to live in Iowa, where we receive over 60 inches of snow and ice and it's still 10 degrees in March. EVERYONE wants to endure that with four kids. Any woman would find this to be a dream come true. Right? Shoot, I must have made a wrong turn somewhere. Darn it. I do like my kids ... sometimes. And I do love to live in Iowa ... in the summer. Big Daddy, WE CAN'T FORGET BIG BIG DADDY, CAN WE? I know, I know ... you have to run. Have to make the rounds. Be a good party goer. Maybe I'll see you out and about. Don't forget to come back when you have more time. I'd love to have you. And, let me know where I can find you and I'll be sure to stop by. It's happening again this year and you'd better bet your bottom dollar that I wouldn't miss it. Last year I found some great blogs by participating and this year I'm hoping for the same. Plus, you can win prizes! Wanna come with me? You can! I don't want to go alone. I won the giveaway over at Iowa Geek. Yup, I did. Naaa Na Naaa Naa Naaaaaaaa Na. CRAP - I've been hanging out with my girls too long. Sorry about that. Just for giggles though, how many of you just stuck your tongue out and put your thumbs against your cheek waving your fingers around? So anyway. I WON! Whoo Hooo. I'm so excited. First I win some great books over at The Bean Blog in December ... and now this. I am one lucky girl, I tell ya. Oh, just got a flash of Keith Urban singing and playing that guitar of his ... hold on ... whew. He is sure HOT. 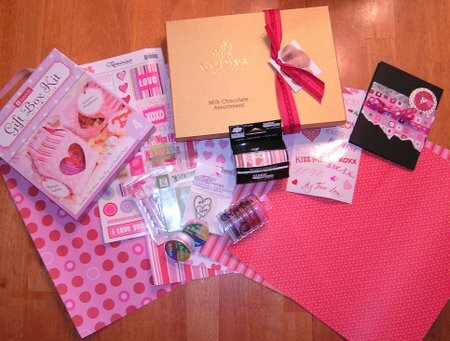 Papers, stickers, stamps, ink pads, ribbons, a handmade photo card/album, set to make gift boxes ... CHOCOLATE. GODIVA CHOCOLATE. Iowa Geek holds a contest like this every single month. So remember, next time I tell you to get over there and enter ... you should.